Spanish Bust Silver Half Reale Coin gold ring from the shipwreck El Cazador , "The Hunter" , Dated 1783. Obverse:Draped bust of Carlos III, inscription around: DEI GRATIA (By the Grace of God), date, CAROLUS III. Reverse: Crowned arms of the House of Bourbon sided by the Pillars of Hercules, assayer and legend around. Ruler: Carlos III; Mint: Mexico City; Country: Mexico; Assayer: FF. Framed in 14Kt yellow gold ring with Fleur de lis motif on shank. Certificate of Authenticity. 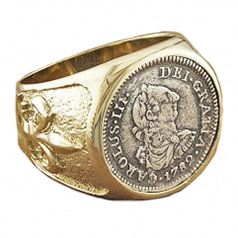 Dimensions; 3/4" diameter coin in finger size 11 ring. The El Cazador, “the shipwreck that changed the world.” In 1784, the ill-fated ship, El Cazador, “The Hunter” was headed toward New Orleans from Vera Cruz, Mexico. The ship was laden with 450,000 pesos, which were intended to solidify Spain’s holdings of approximately one million square miles of America’s heartland, called the Louisiana Territory. The vessel and her crew disappeared without a trace, never arriving to help stabilize the economy. The El Cazador and its treasure sat on the bottom of the Gulf of Mexico for 209 years before a fishing boat off the coast of Louisiana accidentally discovered it. It’s hard to say what would have happened if El Cazador had made it to New Orleans but it could be argued that the loss of this ship did contribute to the unifying of the United States of America.